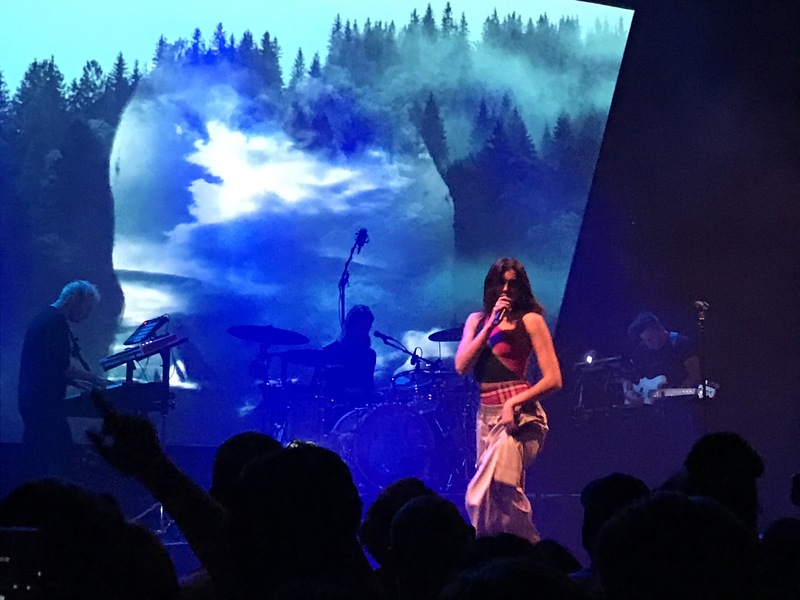 Dua Lipa had a case of strep throat just days before her sold-out show at the Fillmore Silver Spring, but you wouldn’t have been able to tell given her performance last Tuesday. Her energetic stage presence and strong vocals did her infectiously catchy pop songs justice and made her set, while fairly short at just a little over an hour, a great time for her fans to let loose, dance, and sing along. I got to the venue around 7:00pm, when doors were supposed to open, and even though the line wrapped around the building, I ended up being middle-left for the show, which was good considering I didn’t have to wait for hours. I didn’t have a chance to eat before the show, but it was easy enough to get a burger at one of the venue’s multiple bars, which they smartly served in a Chinese-takeout style box for easy consumption. Overall, the Fillmore is a clean, spacious, well-ventilated venue with a nice ambiance and easy access to food and drinks. 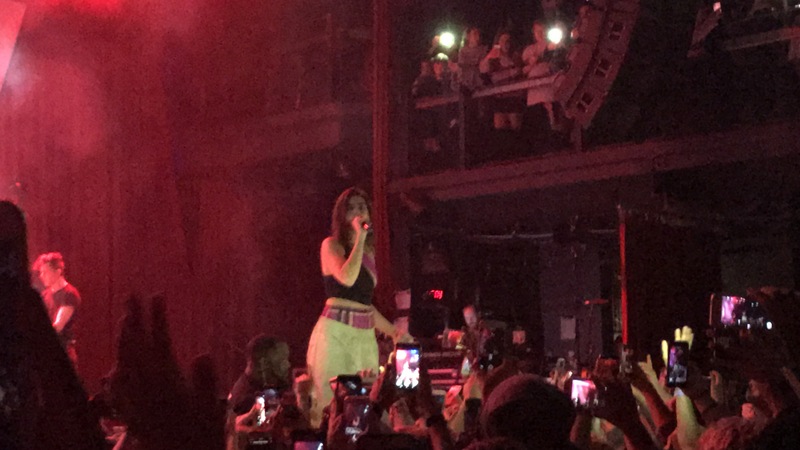 Dua’s opener was 16-year old Marteen, a singer whose music is definitely pop, but includes playful rapping in verses over bouncy production. While he is definitely a talented singer, his age made some of his lyrics a little uncomfortable (and cringy), such as: “Girl you got a body like sriracha/… Got it from your momma but that ain’t what she taught ya.” Still, he had good stage presence and confidence for such a young performer. Dua then kicked off her show with “Hotter Than Hell,” which was a great choice to pump up the crowd. She kept the energy up with a mashup of “Dreams” and “No Lie,” and then “Lost in Your Light.” I wished that her mic was louder for these first few songs because the bass was so deep. However, on “Garden” you could hear her voice really shine. The strong vocals continued on “Last Dance,” although it appeared that there was some help from a backing track on one of the bigger notes. However, this doesn’t negate the fact that, on the whole, her own vocals were very strong and clear throughout, especially for someone recovering from a throat illness. For most of the uptempo songs, Dua danced passionately, and there was a spontaneity and naturalness to it that made it seem like she was just genuinely caught up in the energy of the songs like everyone else. Her movement around the stage really helped keep the crowd engaged and captivated and brought the songs to life. The stage was simple yet striking, with a large trapezoid screen that gave the optical illusion of leaning forward to create a more immersive visual. Each song had different lighting schemes and graphics to go with it and together they created distinct moods for each one. She also performed her collaboration with DJ Martin Garrix “Scared to Be Lonely” and “Begging” as the last songs before the encore. When she came back out, she started with the ballad “Homesick,” and continued with her bubbly hit “Be the One,” which involved her standing on the front barricade and audience participation. The final song of the night was of course her smash hit “New Rules.” The audience did all the “rules” a capella and it was a high energy note to end on. There were some great moments of fan engagement and love throughout the set, beginning with one fan giving her a banner with her name in rainbow surrounded by a bunch of signatures and her posing for a photo with it. Then someone gave her a pride flag and she hung both on her mic stand for a song, a sweet gesture of solidarity, before displaying them on the front of the drum stand for the rest of the show. Over the course of the show she was very vocal about her love and appreciation for her fans and needless to say it was very well received. 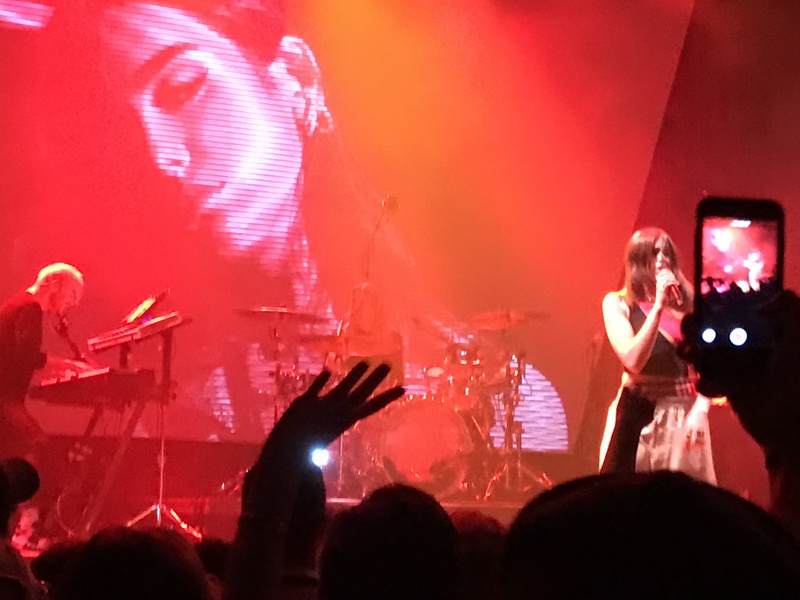 Overall, the show was a short, but very sweet showcase of Dua’s work thus far and her talent as both a singer and a performer was further proof that she has what it takes to be an even bigger pop star. Annie Gott is a sophomore in the SFS, from Falmouth, ME, who is (probably) majoring in Culture and Politics. When not obsessively listening to Frank Ocean, SZA, or John Mayer, she is involved in Georgetown's Institute of Politics and Public Service, GUMSHOE tutoring, and GU College Democrats, and can also be found jamming out at the front desk of the Sociology Department.